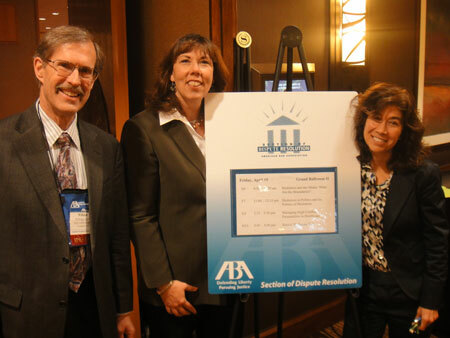 ABA Dispute Resolution Conference in Denver on April 15, 2011: "Managing High Conflict Personalities in Healthcare," with Bill Eddy, Debra Gerardi and Ellen Waldman (right). During the past two months, I had the opportunity to speak at two national conferences about managing high-conflict people (HCPs) in healthcare – one in New Orleans and the other in Denver (last week). Interest is strong in this topic, as healthcare organizations face many types of pressures and when HCPs are involved, it can become extremely intense – and sometimes dangerous for patient care. Yet, healthcare professionals are healing professionals and most of them want to do the best they can for their patients and their family members. For example, it’s easy for people to expect that healthcare professionals can fix any problem, save any life, and ease all pain. Unfortunately, this isn’t always possible – regardless of how hard everyone tries. When an HCP is involved as a patient, he or she sometimes becomes so demanding that it makes it difficult for everyone to help them, and they draw attention away from other patients whose needs are just as important and sometimes even more urgent. A different problem occurs when healthcare professionals (doctors, nurses, therapists, social workers, administrators, etc.) are in conflict with each other. Recent rules and standards from the Joint Commission require conflict resolution training for leadership groups in healthcare, as paying more attention to this issue may save lives, boost morale, and improve the quality of care. Much of the conflict has to do with some HCPs in each profession, including doctors, nurses, therapists, social workers, administrators, etc. Lastly, in the current political environment, healthcare laws are getting a lot of attention. All-or-nothing thinking and unmanaged emotions are typical of HCPs (including some politicians and talking heads) and not a good approach to addressing these (or any) complex problems. The future health of the nation depends on our ability to solve conflicts in a healing, rather than hateful, manner. I was pleased to see so many healthcare and legal professionals at these conferences considering collaborative approaches to problem-solving, including mediation and training in methods for managing HCPs as ways to further these goals.